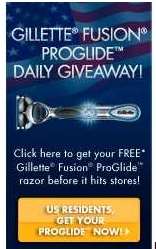 If you haven’t been able to get a Free Gillette Fusion ProGlide yet you can head over here to try. The link is on the bottom right. This is only for those that haven’t requested one yet. They will go fast so let me know when it’s done as I can not tell since I already requested mine.